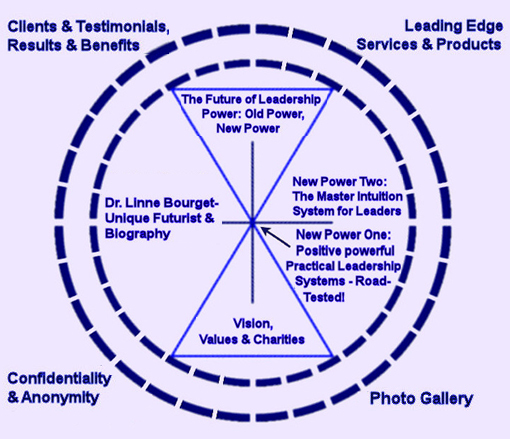 Dr. Linne Bourget, M.A., M.B.A., Ph.D., "The Practical Ph.D."
We are a leading-edge, one-of-a-kind leadership consulting firm founded by CEO Dr. Linne Bourget, M.A., M.B.A., Ph.D., "The Practical Ph.D." positive leadership pioneer with powerful, unusual background, training and experience in eight fields of knowledge. We have a Passion for the Practical! Powerful practical FAST, easily learnable, road-tested integrated systems for all aspects of positive appreciative strengths-based transformational leadership and change. Master Intuition System, started in the 1980s, for all aspects of leadership, business strategy, product development, R&D, culture development, and more. Without full knowledge of your best, you have only half the truth – the worst half. How well do you understand what the huge Power Shift means for your career as a leader, and for your company's ability to compete in the Idea Economy? Do you know the risks of the five dangerous trends and the four unprecedented demands for you as a leader and for your company? How well-prepared is your company for the Power Shift? Do your leaders have the systems and tools needed to succeed? 90% of employees want to leave their jobs! (CNNMoney) How will you protect your company from costly talent/knowledge loss? Great results flow from what's right, not from what's wrong? To see someone for their highest and best transforms them greatly, and the seer even more. Can You Pass this Leadership Test? What is a Positive Focus and Why Should I Lead Positively? >>>Read! Our FAST systems save you huge amounts of time, money and stress, lowering costs and risks as you speed to better results.>>>Read More! We have a Passion for the Practical!>>>Read More! Radical Respect and Advanced Appreciation for Clients - A Passion for the Practical >>> Read More!
" I always learn something from you..you don't waste my time. " Vice President, Fortune 100 Corporation. © 2001-2019, Linne Bourget, M.B.A, Ph.D. All rights are reserved. What You Say Is What You Get™ is a registered trademark of Dr. Linne Bourget. No portion of this website or any products mentioned on it or sold from it, or products in the What You Say Is What You Get™ series may be reproduced in whole or in part, in any manner, format or medium, known or unknown without express written permission of What You Say Is What. You Get™ author, Dr. Linne Bourget. Terms and ConditionsThe content on this website is for information purposes only and does not constitute or substitute for advice or recommendations, coaching or consulting. Information on this site is to be used only for legal and ethical purposes.